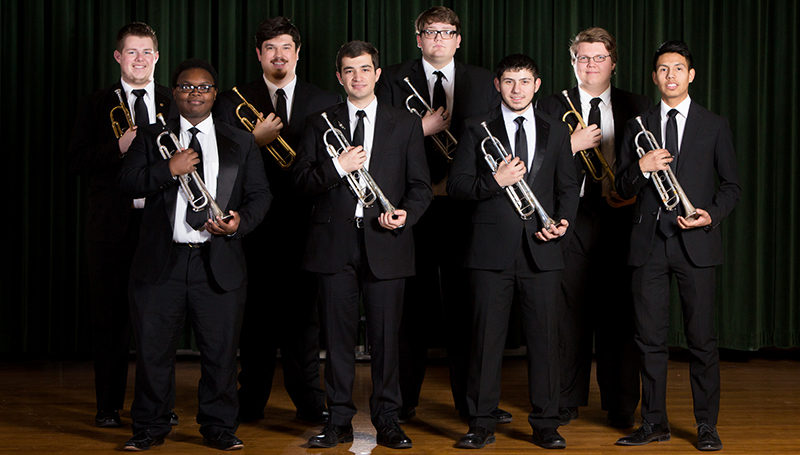 The members of Missouri Southern State University’s trumpet ensemble will compete against other elite musicians from around the country during an upcoming national competition. During the Board of Governors meeting on Friday, March 17, board members learned that the ensemble has been selected as one of 16 from around the country to compete at the 2017 National Trumpet Competition, to be held March 23-25 in Denver, Colo. They’ll compete against peers from Oklahoma State, Baylor, Texas Tech, Southern Methodist University and others. Under the direction of trumpet professor Freddie Green, the eight students – Valentin Vizcaino, Jemetrius Brown, Tyler Jones, William Roach, Jalen Ybarra, Oliver Smith, Austin Kinard, Tony Sfortunato – will perform Erik Morales’ “Infinite Ascent.” They will also have the opportunity to attend master classes and clinics, as well as network with performers and representatives from potential graduate schools. Green says his students were extremely dedicated to performing at an elite level. Dr. Richard Schooler, dean of the School of Health Sciences, gave an update on the Yours to Lose – Advanced Medical School Acceptance Program. To date, 23 students have been accepted into the program, which will grant them acceptance to KCU as the same time they are admitted to Missouri Southern. Thirteen of those students are from the local region, and another 10 from the Kansas City and St. Louis areas, as well as Texas and Illinois. Board members also heard from Blair Freed, a senior biology major from Joplin. Freed has been accepted to Kansas City University of Medicine and Biosciences’ first class this fall at the new Joplin campus. In other business, the board approved a proposal from the Budget Committee to authorize the university to increase tuition rates for the fiscal years 2017 and 2018. The FY 2017 increase for in-state and Lion Pride tuition amounts to $1.58 per credit hour – setting a rate of $178.61 per credit hour. The increase goes on the book for the current fiscal year but is deferred for students until the fall 2017 semester. The board then set in-state and Lion Pride tuition rates for FY 2018 at $183.37 per credit hour – an increase of $4.76 per credit hour. Out-of-state rates were set at $366.74 per credit hour – an increase of $9.52 per credit hour. The board also approved a bond resolution authorizing the university to borrow proceeds from revenue bonds – not to exceed $5 million – to continue financing ongoing projects including the Reynolds Hall renovation, construction of Nixon Hall and the Child Development Center’s move to the Joplin Regional Center building.